Guide Map of Denver and Suburbs Colorado. 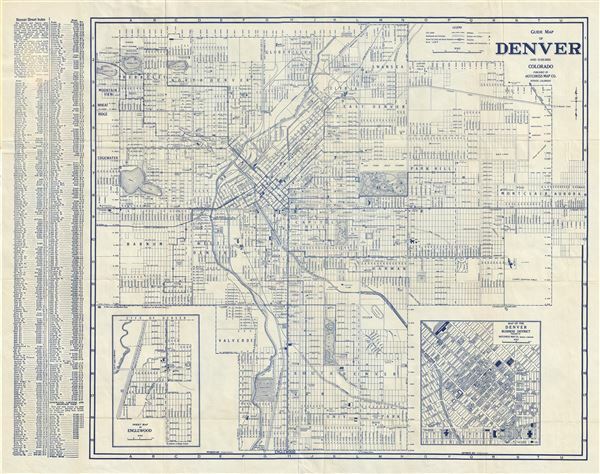 This is a beautiful example of the Hotchkiss Map Co.'s 1947 map or plan of Denver, Colorado and its suburbs. Centered on Capitol Hill, this map covers all of Denver from Lakeside Lake to Aurora and from 54th Avenue to Englewood. An inset map of Englewood is included in the lower left quadrant while another inset in the lower right quadrant details the Denver Business District. A street index appears to the right of the map proper. The map is highly detailed showing streets, individual buildings, parks, route numbers, railway lines, churches, schools, and other topographical details. The map was published by the Hotchkiss Map Co. and issued as part of the Denver map Guide in 1947.